Remember: I will not directly judge or give you prizes, provided from Heldenhaft (money prizes) and TheMatrix154 (steam give thanks to Paradox). Winners will be annouced 22 May after one week of community judge here on forum. 7) Teams: you can join with other people in small teams (max 3 partecipant), but declare first this! 10) You can entry in any time BEFORE contest ends and make sure to write your entry in this post, I'll keep it updated! Theme: Androids are not always friends of Magicka! Entry: Back to the past! Theme: Probably "The sky is falling" but not sure. Theme: I don't know yet. Entry: I don't know yet. Technology: I don't know yet. Tecnology: Slick, CalebEngine(Just a general purpose Slick Utility for Components, not ready for release yet). Technology: Vanilla Java or Java + Slick. Theme: The Sky is Falling! Technology: Slick, Artemis, Homegrown XML entity parser. Tecnology: Slick with phys2d on lwjgl applet util. Email: jo.jcat at the big google mail. Last edited by Gornova81 on Thu Apr 21, 2011 2:46 pm, edited 31 times in total. Last edited by Gwinnell on Tue Mar 08, 2011 7:08 pm, edited 1 time in total. so ? no one other than me join on this ? Still twelve days before the competition starts! You can always mix them something like "Android is not always Magika "
Last edited by Tommy on Fri Mar 04, 2011 9:01 pm, edited 1 time in total. Androids are not always friends of Magicka! I will update this post with the necessary information as soon as possible. I'm waiting for your entry to update first post! Also posted on the NinjaCave and on the JavaGaming.Org forums. What is the purpose of the "used only for this contest" email address? Everyone who wants to join the competition has to be a registered forum member to be able to post so we could PM the people, right? 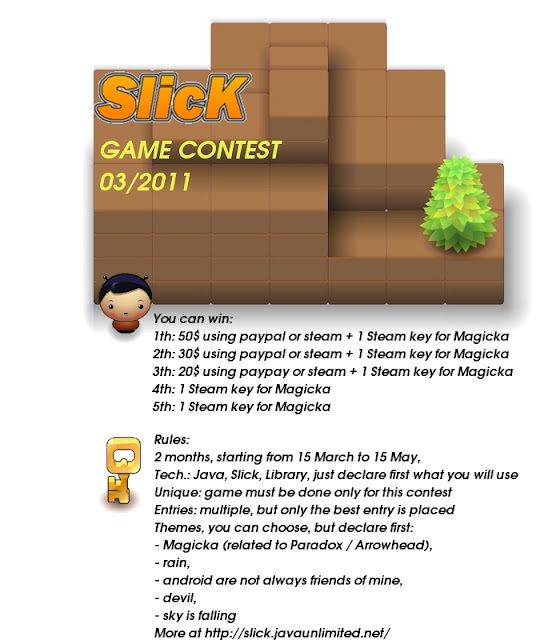 Updated my entry post and also posted about the competition at Right Angle Games. That looks like a good contest to join in. I really love online games so I am maybe qualified to this contest. However, it seems that experts are all around the corner of the game. Last edited by ginjanelong on Sat Mar 12, 2011 10:13 am, edited 1 time in total.